Lost in the significant news and noise around GE over the last year is a major shift in correlation coincident with the announcement of the Baker Hughes deal. 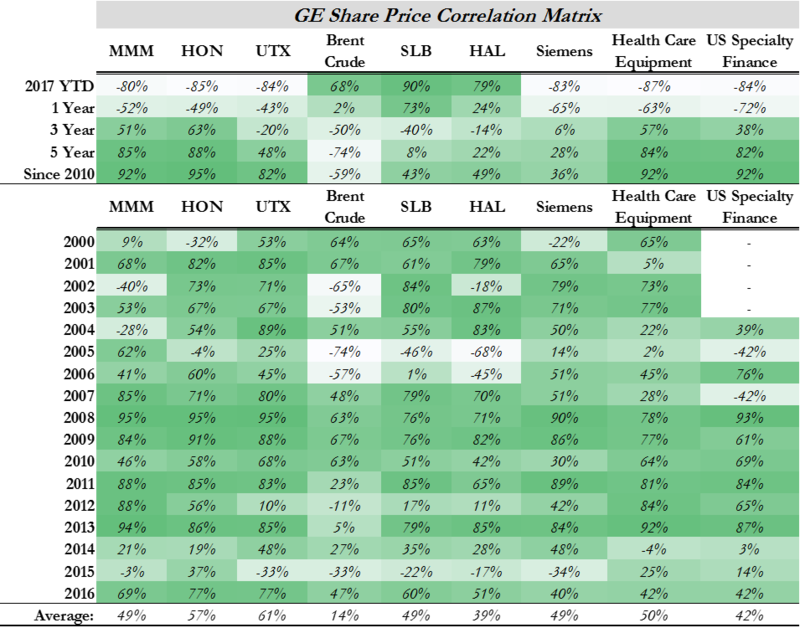 GE has generally been well correlated with other conglomerates throughout the last 17 years, but the Baker Hughes announcement changed everything and YTD the correlation with everything except oil, SLB and HAL has broken down. We are measuring daily share price moves versus the proxies in each case and the data is summarized in Exhibit 1 below – the deeper the shade of green, the greater the correlation. 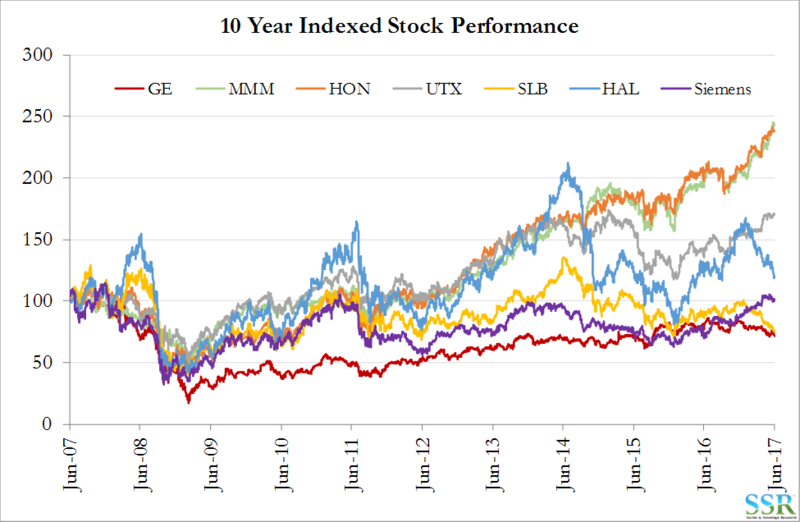 GE has underperformed every potential proxy over the last 10 years, but GE’s new bedfellows have underperformed everyone else recently, and (worryingly) are more volatile. This further supports our view that GE should exit this venture as soon as any synergy driven gains have been achieved – GE should spin its share off to holders – or better yet do some sort of stock split. Announcing this intent soon would likely be good for the stock. The monthly data for the last year has more noise to it as one would expect without the averaging effect of a longer series of data – Exhibit 2 – but the Baker Hughes deal was announced in October of 2016 and the shift in correlation began at that time. The year to date summary in Exhibit 1 is quite noteworthy. The increase in the oil and oil services correlation is as pronounced as the breakdown in the more traditional correlations. We have talked about the risk of GE investors focusing more on the impact of oil prices than anything else going on at the company and this analysis is supportive of that concern. The investment risk is that whatever good the incoming CEO may do with costs and margins in other businesses, swings in oil prices will ultimately drive GE’s share price. There has been very little success in predicting medium term oil price moves over the last 30 plus years, and investors will be distracted from what is really going on in the heart of GE if oil remains as volatile as it has been recently. 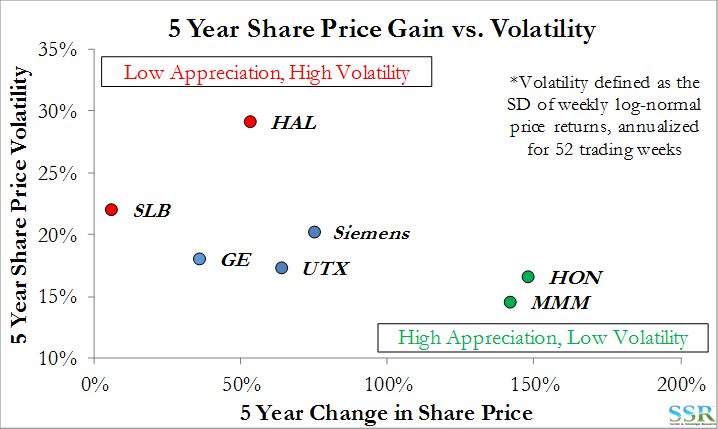 However, in addition to the commodity risk associated with the oil price, GE is taking on an additional problem, which is that its new proxies have more volatile share prices than its old proxies – driven by oil investment and maybe simply an over-reaction to swings in the commodity – Exhibit 3. The share price history over a longer (10 year) horizon is summarized in Exhibit 4. Over the 10 years, HAL has done better than GE but SLB has not. If we were the new CEO of GE we would want to move the portfolio towards those of HON and MMM and not HAL and SLB. We believe that the Baker Hughes deal is a good one as it takes GE’s largely second tier energy business and combines it with a much stronger player. It is, in our view, a great exit strategy for this business – combine – drive synergies and then exit. If executed well it is a deal that could draw some of the benefits of the ongoing Dow/DuPont transaction(s). We would encourage GE to look at a stock split rather than a simple spin for this business, giving holders a choice of whether they want GE stock or Newco stock (or how much of each) – this avoids the inevitable initial selling pressure on Newco if the company is simply spun out to GE holders. We generally associate higher volatility with lower multiples, and can demonstrate this across most of the industrials and materials space. 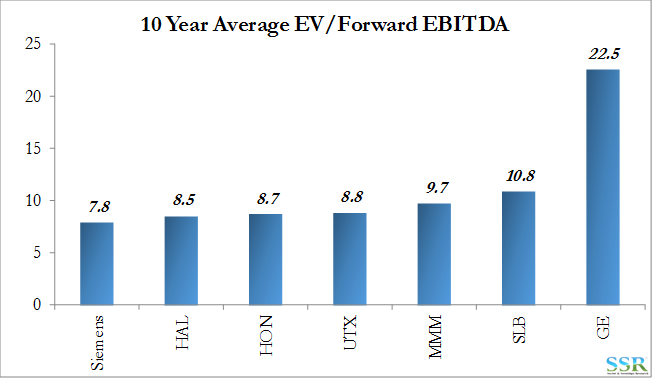 In this instance, however, we do not get that result when we look at EBITDA multiples – Exhibit 5 – and it is clear how much of an expectation premium is already imbedded in GE. 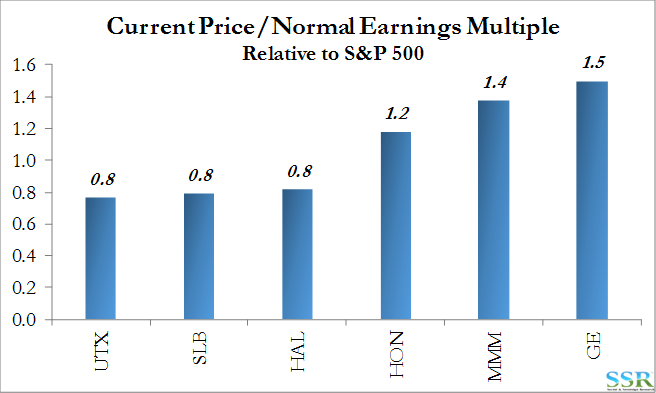 If we look at current multiples of mid-cycle earnings we do see the discount in the oil service names – Exhibit 6. The Oil Services business has already become the most significant influence of performance and valuation for GE – before the deal is closed. It is a correlation that does not benefit GE and it is a proxy group that will likely be a drag for shareholder returns rather than a boost. This further supports our view that Oil Services should be an early divestment for the incoming CEO and that it is a strategy that should be announced soon, even if it takes a year to integrate and then separate the business.